N Bhat, S Zadie, M RIYAD, S Bukhari. Clinical Profile And Management Of Incisional Hernias: An Experience. The Internet Journal of Surgery. 2009 Volume 26 Number 1. Incisional hernia is one of the most common problems that a general surgeon is faced with. More often than not the problem is recurrent and tests the abilities of even the most experienced surgeons. We present our previous experience at repair of incisional hernias along with the analysis of results. A total of 76 patients (27 prospective and 49 retrospective) were studied. Only patients with postoperative incisional hernias and above an age of 15 years were included in the study. We conclude that prolene mesh hernioplasty by onlay technique provides excellent results especially in large sheath defects and recurrent hernias. Among the major catastrophes that can follow abdominal operations wound infection and wound dehiscence are two of the most serious. These complications are likely to be followed by incisional hernia within months or perhaps a few years. 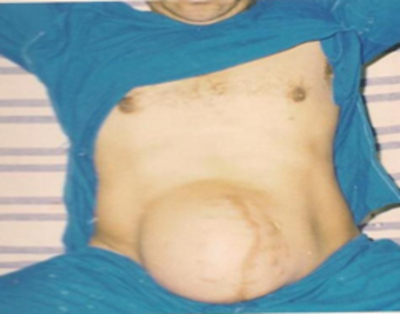 Besides increasing in size with time, an incisional hernia can incarcerate, obstruct, strangulate or cause necrosis and perforation, causing a risk to the patient’s life; hence the need to repair these hernias. Incidence of incisional hernias in the best centres is 10%, the recurrence rate after repair is around 40% but seems to be related to the technique of repair (1). Factors such as obesity, diabetes mellitus, wound infection and lower abdominal incision have a higher rate of incisional hernias and recurrence after repair. Hernias less than 4cm wide have a recurrence rate of 25% compared to 41% for those more than 4 cm wide (2). An incisional hernia can develop in any abdominal incision including the laparoscopic port sites (3). Patients usually complain of a bulge and a dragging sensation aggravated by coughing and straining. 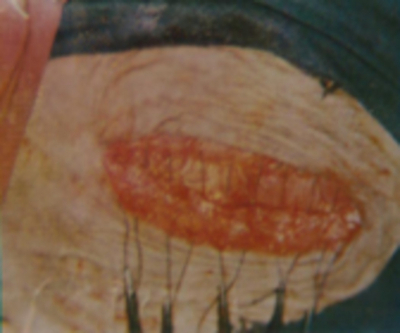 Occasionally, the overlying skin may ulcerate causing rupture of the hernia (4). Intestinal obstruction and strangulation are also well known presentations. Surgery is usually required for pain and discomfort or in those hernias which are large and have a small opening with a risk of strangulation (5). FIG. 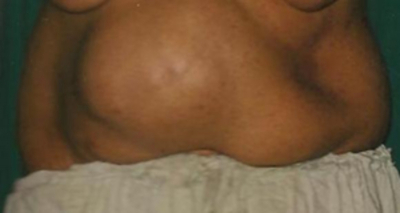 1: INCISIONAL HERNIA FOLLOWING CESAREAN SECTION. FIG. 2: INCISIONAL HERNIA FOLLOWING OPEN CHOLECYSTECTOMY. 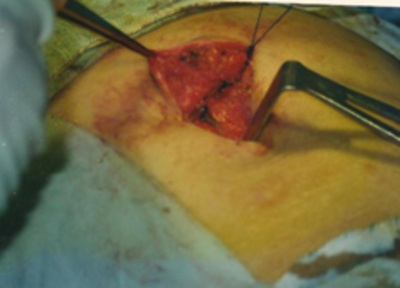 FIG 3: INCISIONAL HERNIA FOLLOWING EXPLORATORY LAPAROTOMY. The study was conducted in the departments of general and plastic surgery at the Sheri-Kashmir Institute of Medical Sciences, Srinagar, India. The prospective study included all patients operated at this institute from November 1997 to March 2000, a total of 27 patients. The retrospective group included all patients operated here between January 1988 to October 1997, a total of 49 patients. a. History of previous surgery and postoperative complications if any at that time. b. History of diabetes mellitus, COLD, renal disease, liver failure, malignancy and frequency and urgency of micturition. c. History of drug intake like steroids, immunosuppressants etc. In addition to detailed general physical examination, thorough local examination assessing for the size and shape of defect, pulsatility, reducibility, other hernial orifices and previous scars etc. was carried out. Routine laboratory examinations were carried out in all patients. Depending on comorbidities, some patients needed lung function tests, echocardiography, lipid profile etc. Surgery was timed at 12 to 18 months after the surgery leading to incisional hernia unless the patient presented late. Recurrent attacks of subacute intestinal obstruction, incarceration, irreduciblity and strangulation led to emergency surgery in some cases. Obese patients were encouraged to loose weight; smokers were encouraged to quit smoking. Patients with other comorbidities like COLD, diabetes and hypertension were optimized for surgery. All patients received preoperative antibiotics. All patients were operated under general anesthesia. A uniform surgical approach is not possible in these patients. The surgical treatment needs to be individualized for each incisional hernia patient. Pre-operative pneumoperitoneum is used in some centres to stretch the abdominal cavity prior to hernia repair (6). Low molecular weight heparin and single dose antibiotic prophylaxis have been found to be beneficial (7). The incision to be made was decided by the operating surgeon according to the site and size of the incision. Any other abdominal problem was dealt with at the same time as the repair. Here the old scar was excised, the hernial sac was opened and adherent omentum and small gut loops dissected free. 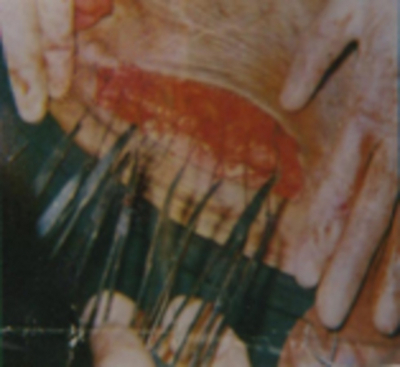 After closing the peritoneum the defect was closed by a continuous 1-0 prolene suture taking bites at least 3cm away from the edge and spaced at 2cm. The method was found useful for small defects. In this method, relaxing incisions were made on the lateral aspect of the anterior rectus sheath thus allowing easier and relaxed approximation of the anterior sheath in the midline. This method was found to be useful for large upper-midline incisions. Reconstruction of the linea alba was done by a modified double breasting technique and the sutures were placed in near-far and far-near sequence. On tying the suture, a 4-layered linea alba was created. This method was useful for moderate-size defects. On-lay technique was used. This technique was found to be useful for large defects and were previous repair had failed. This procedure produced the best results in our study. 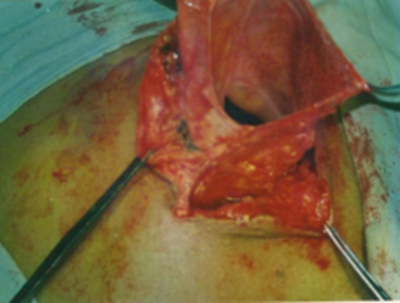 Here a tensor fasciae latae myofascial flap was raised from the thigh and was tunneled onto the defect on the abdominal wall, to have a tension-free closure. The myofascial unit was bared on its single pedicle, the transverse branch of the lateral circumflex femoral artery. This method was useful where previous attempts at primary closure or prosthetic mesh had failed. It was especially helpful in the obese. After the operation, the patient was shifted to the recovery unit. Oral feeds were started in the late evening or on the first post-operative day. Post-operative antibiotics were given only in selected cases. Abdominal binders were used in all cases after repair. Drains, if used, were removed around the 2nd post-operative day. Stitches were removed around the 10th to 12th post-operative day. Any post-operative complications were recorded. The patients were followed in the out-patient clinic on the 13th post-operative day while continuing the use of abdominal binders. They were advised to refrain from lifting heavy weights or performing any kind of strenuous activity. The youngest patient operated in our series was 17 years old and the oldest to be operated was 54 years; 58 of 76 patients (76.31%) in this study were between 21-40 years of age. Mean age was 33.25 years (SD±8.24). There was a female preponderance in cases of incisional hernia, females being 63.15% as compared to males who were about 36.84%. The male to female ratio was 1:1.71. Among the postoperative complications from previous surgery, wound infection was the dominant risk factor present in 39 patients (51.31%); respiratory tract infection and cough was seen in 12 (15.78%). Other post-operative complications of previous surgery were abdominal distension in 9 cases, constipation in 7 cases and urinary retention in 3 cases of incisional hernia; 6 patients (7.89%) had no history of complications of previous surgery. Out of 76 patients, wound closure had been performed previously by catgut in 48 (63.15%); 28 (36.84%) had wounds closed by using prolene (21.05%) and 12 (15.78%) by vicryl. In our series, most of the patients were obese (59.21%). Around 81.57% were moderately anemic and 55.26% had lax abdominal wall with poor muscle tone. Forty-four patients (57.89%) had previous midline (mostly lower) incisions, 25 (32.89%) had previous paramedian incisions. Only 9.21% had previous transverse incisions. Out of 76 patients, 64 cases of incisional hernias (84.20%) appeared within the first year of previous operation, 15.78% after one year of previous surgery. The musculo-aponeurotic defect was 4-6cm in 21 (27.63%) cases, 31 (40.78%) had a defect of 6-8cm, 7 (9.21%) a defect of more than 10cm. The hospital stay in the group of patients managed by primary repairs of the musculo-aponeurotic defect ranged from 2-3 days with a mean hospital stay of 2.5 days and a standard deviation of ±1.419, while for the group of patients repaired by using prosthetic mesh and flap cover of the defect, it ranged from 3-4.5 days with a mean hospital stay of 3.75 days and a standard deviation of ±1.81. 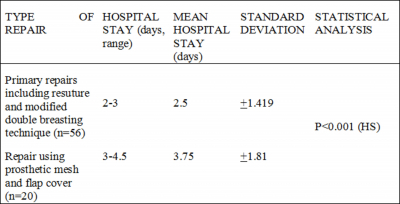 Applying Student’s t-test, the P-value derived is P <.001, meaning that the difference between the hospital stays of the two groups is statistically significant. 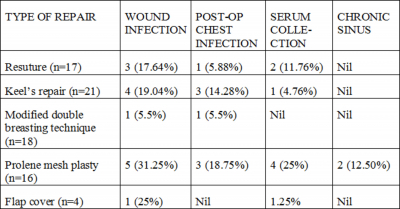 From the above table, we can see that wound infection was the most common complication, in all groups of repair, with the maximum in the group repaired by prolene mesh plasty (31.25%) followed by a single patient (25%) out of the four repaired by flap cover. It was managed conservatively. Post-operative chest infection was common in all groups except where flaps were used; 2 patients (12.50%) in the group repaired by prolene mesh plasty developed a chronic sinus which settled after curettage. There was no mortality in our series of patients. Satisfactory closure of abdominal incisions remains a challenge. Incisional hernia testifies the lack of perfection of closure of abdominal wounds. Although the incidence of burst abdomen has been reduced by the use of a mass closure technique, incisional hernia remains an important problem. Incisional hernia occurs at an earlier age in our study, possibly because of early marriage and multiple pregnancies in our women; a similar age incidence has been reported (8). Incisional hernia affects both sexes. In our study females predominated (63.15%). Male-to-female ratio was 1:1.71. The common presentations are the same as internationally reported including painful prominent swelling and abdominal discomfort and obstructive episodes of abdominal colic and vomiting (9). 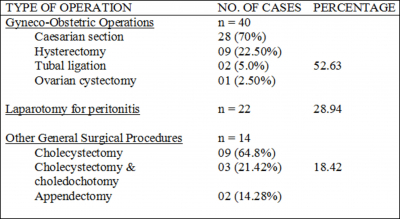 In our study 40 patients (52.63%) had previous operations in female pelvic organs which was mainly Caesarian section (28 patients), 22 cases (28.94%) developed after exploratory laparotomy for peritonitis. Cholecystectomy (9 cases) was the most frequent general surgical procedure resulting in incisional herniation. Similar results have been published in other studies (63,64). Wound infection was the most common complication after the initial surgery, present in 51.31% of cases. This was followed by respiratory tract infection and cough, found in 15.78% of cases; 11.84% of cases had developed post-operative abdominal distension and 7.89% of patients had an uneventful post-operative period after the surgery which led to the hernia. Post-operative pulmonary complications definitely increase the incidence of herniation because of the strain placed on the wound closure by coughing or straining. 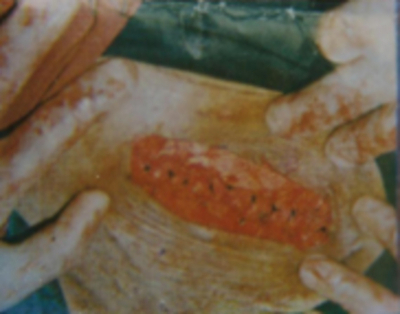 In our study, after going through the previous records and discharge certificates of the patients, it was found that out of 76 patients, wound closure had been performed by catgut suture in 48 patients. The reason for this high incidence of dehiscence is that catgut does not retain its tensile strength longer than 10 days and this is not long enough for the linea alba or rectus sheath to heal strongly. Suture technique affects both early and late complications. The rate of incisional hernia is lower if the suture length/wound ratio is four or more. This ratio depends on the interval between stitches and stitch length; the latter reflects the size of the tissue bites but this relation also depends on the suture tension. However, a high ratio should not be achieved by suturing with a stitch length of 5cm or more as this is associated with an increase in the rate of wound infection (11, 12). Obesity was one of the dominant risk factors in our patients, 59.21% were obese; 81.57% of the patients were moderately anemic. Obesity is associated with a threefold increase, with fat not able to hold the sutures because the excess fat adds enormous tension on the sutures, causing a defect in the abdominal wall. Also, obese patients are more prone to develop post-operative complications like atelectasis, paralytic ileus or pneumonia which increase the incidence of incisional hernia (8, 9, 14). In our study, 44 patients had previous midline incisions, 25 had previous paramedian incisions and only 7 had previous transverse incisions. Similar results, reporting the increased frequency of incisional hernias after midline and paramedian incisions as compared to transverse incisions, were given by other studies (8, 9, 13). Resuture of the defect was performed in patients who had small defects; 2 patients who presented with intestinal obstruction were also managed by resuturing of the defect after reduction of the contents, and separation of adhesions. Most of the moderate-size defects were repaired by Keel’s repair and modified double breasting technique. In 2 patients in whom previous repair had failed and in 2 patients with large defects, a tensor fasciae latae myofascial flap was rotated from the thigh and used to cover the defect. Tensor fasciae latae myocutaneous flap for reconstruction of the defect is regarded as the method of choice in the reconstruction of major defects of the abdominal wall (15). We used mesh repair in 20 of our patients with very good results. All large incisional hernias should be repaired by prosthetic procedures (16). In giant ventral hernias where primary repair is impossible, definitive correction can be obtained by applying two layers of expanded polytetrafluoroethylene to reconstruct the fascia and reinforce the abdominal wall (17). In our study, the majority of the patients were managed by primary repair techniques. This was because most of our patients were laborers or housewives and could not afford prosthetic materials. Hospital stay for the group managed by primary repair of the musculo-aponeorotic defect was shorter than for the group managed by using prolene mesh or tensor fasciae latae myocutaneous flap to cover the defect. This difference is statistically significant (P<.001). Our results are almost similar to other major cited studies (2, 13, 18). Wound infection prevailed as the most common complication in all groups of repair. Chest infection was managed by chest physiotherapy and adequate antibiotics. Other complications that we encountered were seroma formation and sinus formation. The results after different types of repair of incisional hernias were analyzed and recorded as successful repair or recurrence of the hernia. A 100% success rate was seen in the group managed by flap cover. The success rate in the group managed by prolene mesh plasty was 93.75% with a single recurrence (6.25%). Maximum recurrence was seen in the groups managed by resuture (29.41%) and Keel’s repair (23.80%). The success rate after resuture and Keel’s repair was 70.58% and 76.19%, respectively. Out of the 18 patients repaired by modified double breasting technique, 16 (88.88%) had a successful repair and recurrence was seen in 2 (11.11%). These results were corroborated in other studies (21, 19, 22, 9, 16). In our study, although wound infection was seen in 1 patient and serum collection in 1 patient, out of the four repaired by using tensor fasciae latae myofascial flap cover of the defect, the fascia never sloughed nor did the complications cause any failure. Once applied, the fascial patch seems to survive indefinitely and virtually without symptoms. Out of the primary repair techniques, modified double breasting seems to the most feasible because suturing involves near-far and far-near technique which results in uniform distribution of tension. Also, as the sutures are interrupted there is less tissue snagging and ischemia. High recurrence rate was seen after resuture and Keel’s repair, mostly due to the fact that these suture techniques are based on the principle of approximation of the defect edges which leads to excessive tension and subsequent repair failure. For large sheath defects, where primary repair may be accomplished under tension, prolene mesh hernioplasty is the need. This mesh acts as an artificial, non-absorbable, endo-abdominal fascia, making the abdominal wall instantly and definitively pressure-tight. 1. Mudge M, Hughes LE: Incisional hernia: a 10-year prospective study of incidence and attitudes. Br J Surg; 1985; 72: 70-71. 2. Hessilink VJ, Luijendijk RD, de Wilt JHW, Heide R, Jeekle J: The Netherlands: An evaluation of risk factors in incisional hernia recurrence. Surg Gynecol Obslet; 1993; 176: 228-34. 3. Montz FJ, Holschneider CH, Munro MG: Incisional hernia following laparoscopy: A survey of the American Association of Gynecologic Laparoscopists. Obstet and Gynecol; 1994; 84(5): 881-84. 4. Hamilton RW: Spontaneous rupture of an incisional hernia. Br J Surg; 1966; 53(5): 477-79. 5. Abel AL, Clain A: The surgical treatment of large incisional hernia using stainless steel wire. Br J Surg; 1960; 48: 42-49. 6. Caldironi MW, Romano M, Bozza F, Pluchinotta AM, Pelizzo MR, Tonaito A, Ranzato R: Progressive pneumoperitoneum in the management of gaint incisional hernias: a study of 41 patients. Br J Surg; 1990; 77: 306-08. 7. Abramov D, Jeroukhimov I, Yinnon AM, Abramov Y, Avissar E, Jerasy Z, Lernau D: Antibiotic prophylaxis in umbilical and incisional hernia repair: A prospective randomized study. Eur J Surg; 1996; 162: 945-948. 8. 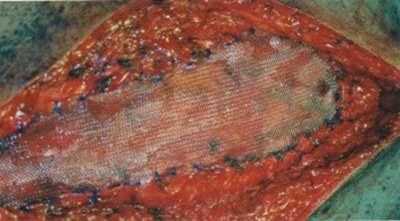 Sharma J, Gupta M, Rani R, Kar J, Rai SP: Prolene mesh plasty in hernia repair. Ind J Surg; 1997; 289-92. 9. Shaikh NA, Shaikh NM: Comparative repair of incisional hernia. JPMA; 1994; 44(2): 38-39. 10. Gislason H, Gronbech JE, Soreide O: Burst abdomen and incisional hernia after major gastrointestinal operations – comparison of three closure techniques. Eur J Surg; 1995; 161: 349-354. 11. Goligher JC, Irvin TT, Johnston D, De Dombat FT, Hill GL, Horocks JC: A controlled clinical trial of three methods of closure of laparotomy wounds. Br J Surg; 1975; 62: 823-29. 12. Israelsson LA, Jonsson T, Knutsson A: Suture technique and wound healing in midline laparotomy incisions. Eur J Surg; 1996; 162: 605-609. 13. Bucknall TE, Cox PJ, Ellis H: Burst abdomen and incisional hernia: a prospective study of 1129 major laparotomies. Br Med J; 1982; 284: 931-33. 14. Sugarman HJ, Kellum JM, Reines HD, De Maria EJ, Newsome HH, Lowry JW: Greater risk of incisional hernia with morbidly obese than steroid dependent patients and low recurrence with prefascial polypropylene mesh. Am J Surg; 1996: 171: 80-84. 15. O’Hare PM, Leonard AG: Reconstruction of major abdominal wall defects using the tensor fasciae latae myocutaneous flap. Br J Plast Surg; 1982; 35: 361-66. 16. Stoppa RE: The treatment of complicated groin and incisional hernia. World J Surg; 1989; 13: 545-54. 17. Rubio PA: Giant ventral hernias: A technical challenge. Int Surg; 1994; 79: 166-68. 18. Misgar MS, Rasheed AB, Shafi A, Reshi F: Modified reconstruction of linea alba in incisional hernia repair. Surgery; 1998; 3(8): 51-52. 19. Hamilton JE: The repair of large difficult hernias with mattressed onlay grafts of fascia lata: A 21-year experience. Ann Surg; 1968; 167(1): 85-90. 20. Houck JP, Rypins EB, Sarfeh IJ, Juler GL, Shimoda KJ: Repair of incisional hernia. Surg Gynecol Obstet; 1989; 169: 379-99. 21. Fisher JD, Turner FW: Abdominal incisional hernias: a ten-year review. Can J Surg; 1974; 17: 202-04. 22. Maguire J, Young D: Repair of epigastric incisional hernias. Br J Surg; 1976; 63: 125-27.